New! Aerial Video of Your Ancestral house and town! 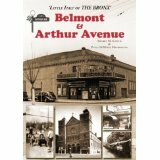 I just finished reading “Little Italy of the BRONX: Arthur Avenue and Belmont” (New York City). Very informative! Described as “One Big Family”, the Italian immigrant culture that developed here is said to be comparable to “a new Italian village”, as Italians from all over Italy merged into one newly formed community. The authors, Stephen M. Samtur and Paula DeMarta Mastroianni, share their wonderful memories of growing up in the 1950’s and 60’s, and give an overview of the history and development of this area of the Bronx. What is now generally referred to as “Belmont” was a neighborhood called “Fordham”. 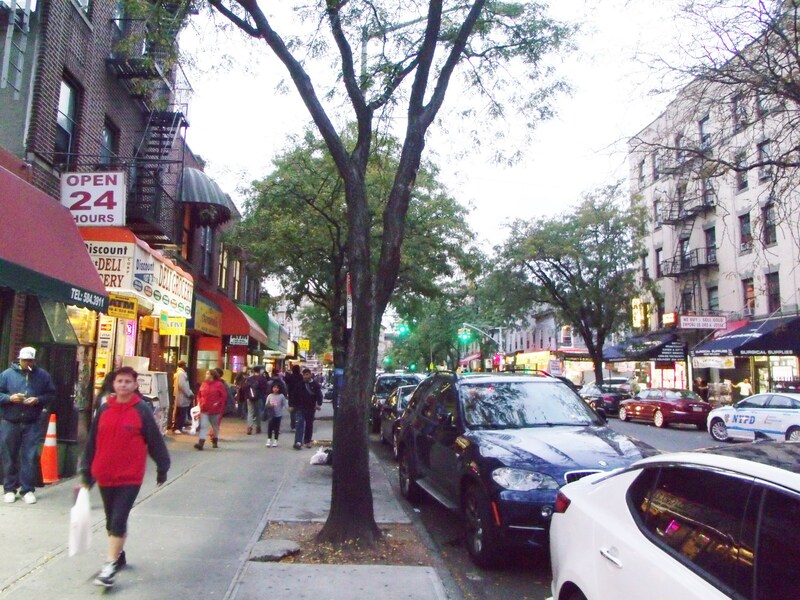 Arthur Avenue (which I visited in person last month), was lined with shops, as it is now. Italian immigrants helped to build the Bronx Zoo, Botanical Gardens, railroads, tunnels, subways, and other construction projects. [p.33]. In the early 1900s, there were farms in the area that needed laborers. Some immigrants started a business. 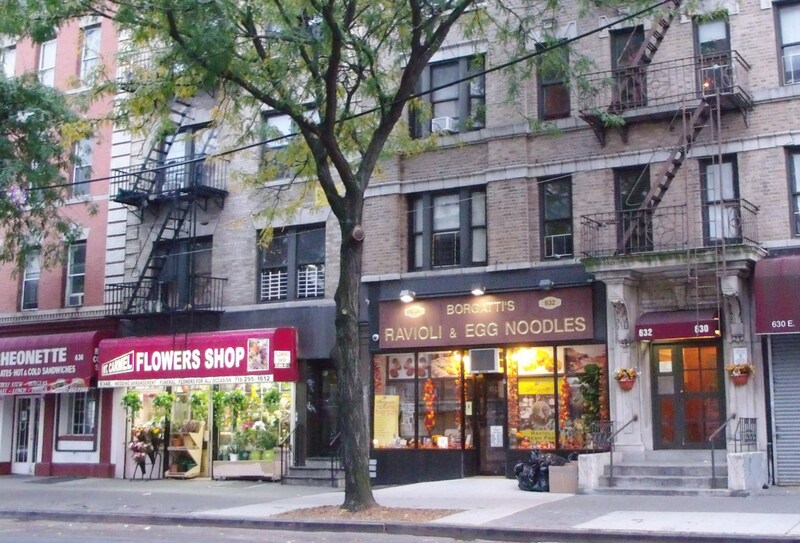 Prior to 1920, it was dominated by noodle, macaroni, and baccala stores [p.5]. Valuable information is given regarding the name of another church a good distance away, the St. Phillip Neri Church, was first used by the Italian immigrants [p.33]–a big clue where to find marriage records from that earlier era of the actual immigrants themselves getting married. For the author, there are “memories of baptisms, weddings, and funeral events” at Our Lady of Mt. Carmel. [p.40] But genealogists seek the documentation that resulted from these events of the past, in order to link one generation to another, and build a lineage. Only so much can be learned about these families by looking at documents though. How wonderful it is that Stephen and Paula got together to write “a collective memoir”, that records “stories” and brings this neighborhood to life, so that we can all visualize the culture Italian immigrants and their descendants had going on in the Bronx. I grew up in a small town, but had the same situation with most of our immediate family living close by. I understand the concept of teenagers having relatives reporting back to parents when seen hanging out in wrong places ! My grandmother and her friends had a gossip phone line. In the Bronx, there was a “Clothesline culture”. Laundry hung out between buildings so close , women could chat back and forth while doing their daily chores. In suburban towns, neighbors tend to be “at a distance”. The Bronx women knew each other from many different daily activities. Because of the close proximity to one another, there was much more “socializing” amongst people in the neighborhood–who happened to be mostly other Italians. They shared Italian traditions, such as everybody cooking meatballs on Sunday. This we did too, but probably only our family. Growing up in the Bronx, most all of their neighborhood friends were fellow Italians. Probably, they didn’t experience as much discrimination for being “strange foreigners”, as my great aunts did in our small town, where they were the lone Italians. In the Bronx there were MANY Italian immigrants (all speaking in the Italian language), so many that they could have an Italian language church. In these city neighborhoods there’s a higher chance that marriage partners would be chosen from another Italian family. Assimilation would be slower—with children remaining “Italian” longer . The author specifically states that it was NOT a “Leave It To Beaver” culture. I suppose our family WAS that (straight off of a 50’s TV show.) 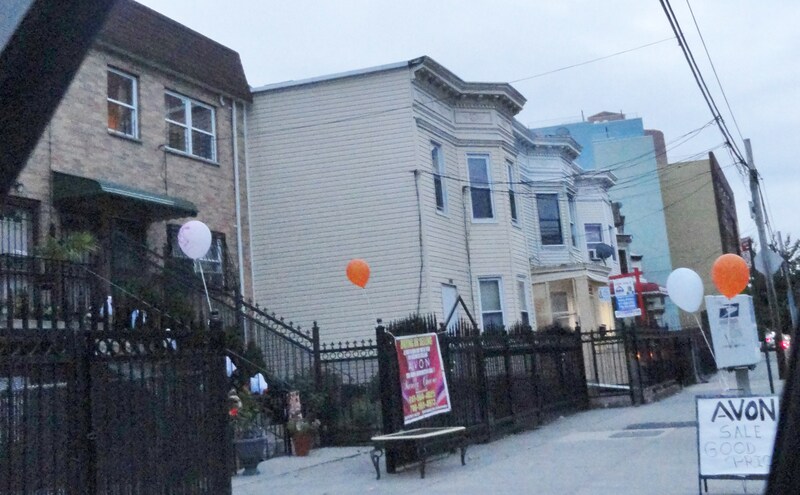 Little Italy of the Bronx was something very different. There are aspects of this kind of neighborhood that people like me really did miss out on ! — the camaraderie and Italian pride. In her latter days, my Italian great grandmother sat in her chair in isolation, staring at the creek behind her house from her 2nd story bedroom window. Whenever I ask what she spoke of, I’m told nobody ever knew what she was saying. She spoke in Italian. Her husband died young, and the two older children born in Italy were “Americanized”, instructed to SHED anything Italian. They were very young when they came. There were a few Italian friends she knew in the next town, but I know she would have enjoyed “the clothesline culture” of the Bronx and having other Italian women to talk to! Little Italy of the Bronx is described as a large territory that covered from Fordham Road to East 180th St., and from Southern Boulevard west to Third Ave. The book has lots of old photographs, dating back to the 1930s, so that we may see the area “as it once was”—in another time. When I walked through this neighborhood recently, I could not possibly have known all that once went on here—the friendships and unique history of this particular neighborhood that bonded these people. 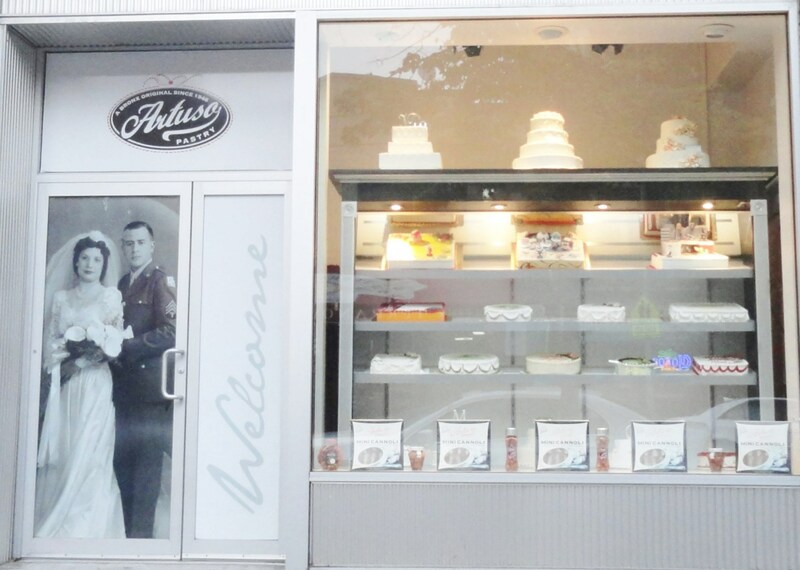 I saw a lot of Italian restaurants, and many wonderful Italian bakeries. But they were all strangers to me. Many are direct descendants of the original Italians who settled this place, and they have by now been through several generations together–bonded through their memories of shared experiences. And it is only through their memories written down, and what has been preserved in old photos and documents, that we who did not grow up there can catch a glimpse of an Italian neighborhood, distinct from any other, yet in many ways the same as other Little Italies. 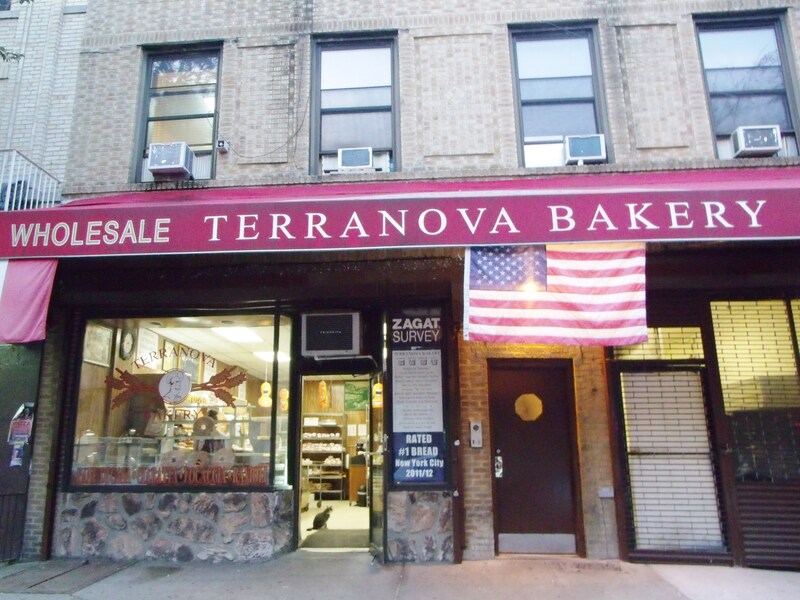 In places like the Bronx, there is still to this day a core of people there who remain full blooded Italian, still keeping the same old Italian traditions alive for the rest of us to be able to visit. If I could go in a Time Machine, back to the golden era of Little Italy of the Bronx, when people who were the grandchildren of Italian immigrants were growing up , I would especially love to have been able to experience the days when the Bronx’s own Dion DiMucci and his friends were hanging out on the street corners “just messing around”, and putting together little songs that were about real people passing by, that they made into “characters” for songs that would become famous across the nation ! That there was a real person named Jack (with a tattoo of “Rosie on his chest”) who “used to swagger down the middle of the street”, “The Wanderer”, [p.139] is so exciting to hear in Dion’s first hand contribution to one section of the book—because the whole nation actually did share in “growing up in Little Italy of the Bronx”, without realizing it ! We all know the words to those songs. I loved hearing about the early days when he and his street corner gang would bang on cardboard boxes or use whatever else was at hand to create music (which to them at the time was just about having genuine fun). He didn’t fit in so well when it came to school and doing homework. He was meant for something else. His talent developed in a time and a place forever recorded through his music. As a teen, Dion liked to go to Greenwich Village “to be with other beatniks”. [p.142]If that was a trend amongst a lot of kids from the Bronx, then this is a clue about where some marriage partners might have come from, and churches in other areas that might have documents. He knew people there who liked to discuss Plato and philosophy, and beat on bongo drums. [p.142]They took the train back and forth. These people did not live in isolation in one neighborhood. They could easily get around all over various areas of New York City on public transportation. But there were certain places where they tended to hang out. There were also little internal migration patterns that developed after the initial arrival of many immigrants. Some remained always in Manhattan, while others went to Brooklyn (but that’s a different place). I studied those Italian neighborhoods on my trip also, but started and ended with Arthur Avenue in the Bronx. Before the trip and the book, I was disconnected from this place. But I felt it was important to become more familiar, because many of my clients have ancestors who lived in these New York City neighborhoods. This book was like a little window that opened up and allowed me to see an overview of a whole era– in a place where I have never been before last month. (actually checking out some specific addresses of a particular Italian family mentioned on old census records) to get a sense of where they lived. As it turned out, one family’s home no longer exists. An obviously rebuilt structure is where it once stood (below, the house on the left is newer). The homes of a certain architectural style are interrupted by the modern building and then continue on in the original style (photo below). This is a clue that there might have been a fire. Perhaps there is a news article to find. But the client’s family moved around to several different streets, and the immigrant also originally lived in Manhattan. I was just “getting a sense of”– all the different places mentioned on census records and other types of documents to better understand this family’s story. On a Sunday afternoon, after a few days in Manhattan’s Little Italy (where the immigrant started out) , we stopped here in The Bronx. We had a nice dinner on Arthur Ave., the commercial center of Little Italy of the Bronx, and spent some time getting photos and “sense of place”. We noticed a girl playing dominos with her father at a little table outside, and others engaged in “a sidewalk culture”. We had driven through on Friday night initially on our way to Manhattan, but now, in the daylight, we could see their faces—lots of Italian-looking people. There was a casual police presence. The neighborhood felt safe for strolling. I noticed the Catholic church, and got pictures. I didn’t know when it was built– if it was old enough to be the one that served the early families. I needed to do further outside research to learn more. So I bought this book. It was a tremendous help in bringing this place to life for a much better understanding—of one particular Italian American neighborhood and its history. Now in the future, if I see the word “Fordham” written on an old document or mentioned in an early obit, I’ll know better what it means—that the person was a member of “that family” (the Belmont & Arthur Avenue Little Italy of the Bronx culture). Knowing something about a community where an immigrant settled and raised his family, is as important as learning the history of the Italian village where he was born. The written history reveals little clues, such as where they went to church, what other places interacted (source of marriage partners), who else lived there (and where they came from) is important if you’re trying to discover the Italian village of origin, as people often followed friends and family to a new location). If his songs were about real characters that he was seeing walking down the street, it’s another way to visualize a time gone by –more than can be learned from just looking at old documents—something different even than looking at old photographs of street scenes. It was the same environment where one client’s family resided for part of their family history story. The immigrant (a barber, from a family of Sicilian blacksmiths) was married in 1908 in Manhattan. But he had moved to the Bronx, and lived on the street with the missing house (on Crotona Ave.), by 1921, the year he became a US citizen. 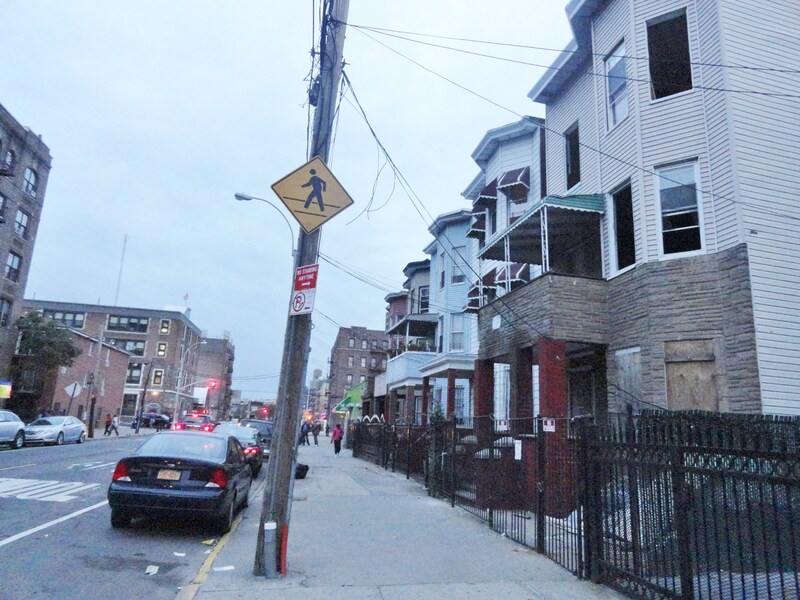 The immigrant’s son (born in Manhattan in 1910) grew up mostly in this Bronx neighborhood. 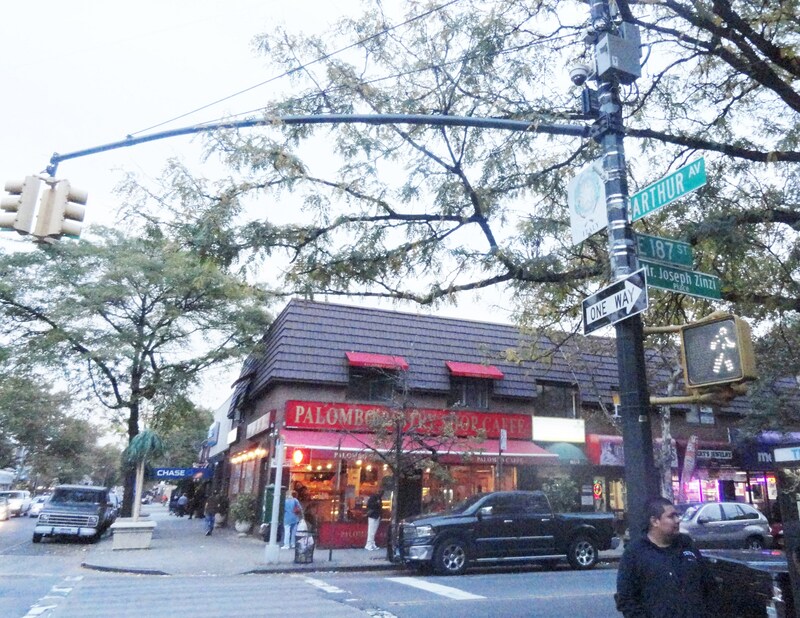 He walked by the same street corner where Dion and his gang hung out, and their life had adapted from Mulberry Street to Arthur Avenue culture. But many Italians of the Bronx are descendants of ancestors who entered the Port of New York and came straight to the Bronx. They followed employment announcements. 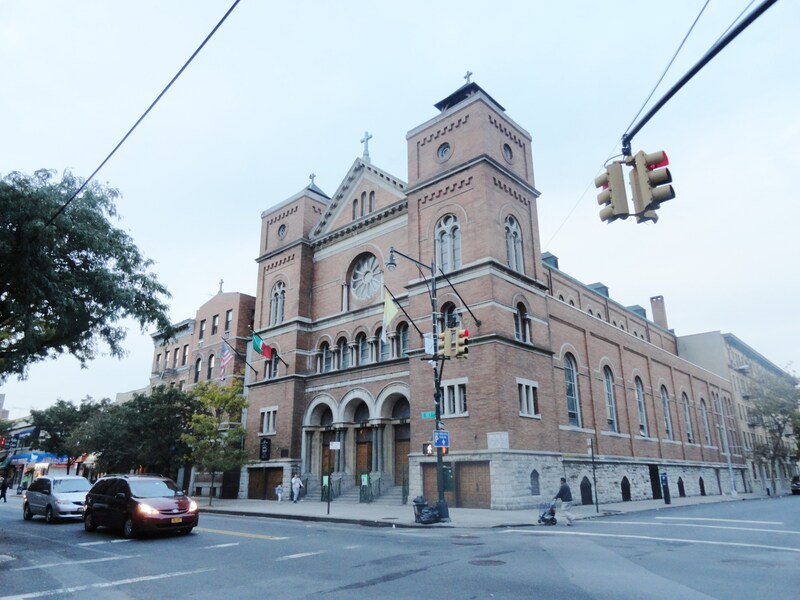 I am going to return to Arthur Avenue in June, to experience their annual St. Anthony’s Feast Day celebration, and would like to see the inside of their Italian church that has served the Italian population there for over a hundred years ! Their church Bulletin is still published partially in Italian. I’m sure I also missed a couple of other things, such as exploring the collections at the local historical society and public library. If you go to check out Little Italy of the Bronx, it might also be nice to visit during Christmas season! They call it “The Real Little Italy”, because it still remains a real and functioning neighborhood of Italian families (compared to some other Little Italies who have been experiencing a dwindling Italian population and now seem more for tourists). You won’t find the accordion man that strolls from one sidewalk restaurant to another, nor a string of gift shops, but there are many authentic traditional Italian food establishments–some that are still run by descendants of those who started the business many decades ago. Searching ship records for a town of origin in Italy. Beware! A major breakthrough towards discovering an ancestor’s town of birth in Italy! We now know her “last residence”, which may turn out to be her place of birth ! I was searching www.castlegarden.org for an 1887 ship record of Grazia Lingria (an immigration date given on a NY census record). I entered only the surname “Lingria” and it brought up a record that was a match to her age, with a husband “Antonio”. She arrived in New York on January 20, 1905 on the ship “Nord America”. The listing indicated she had been in the USA previously (since 1889), which was close enough to 1887, (and such info from census records is often a tad wrong). A street name in New York was mentioned. (It didn’t quite match a known address for this family, but from other records collected we know they moved around). It was a close enough match to follow through on this entry. Now the search is on in the town of Catona, Reggio Calabria, to see if they have her birth record. We have her parent’s names from her 1926 birth record in Broolyn. It says she was born in 1853, but the ship record indicates 1851, and census records in NY indicate 1855. So the search will include 1850-1855. Should have the results in a couple of days from a microfilm search. If it is the correct town, then hopefully they will also have her marriage record, and then will also be able to discover where her husband was born. An exciting aspect of family history research is the discovery of an immigrant ancestor’s village of origin. It would be hard to fully understand your family’s history without knowledge of the historical and cultural context that shaped your ancestor’s lives. There are many approaches to learning about the local history of your ancestral village, including political, socio-economic, and anthropological perspectives. There is also a demographic perspective, which may sometimes be overlooked. Perhaps this is because statistical data at the village level may not be easily available. However, lacking published sources, you can always do your own demographic study utilizing LDS microfilmed records. Genealogists can see their ancestors in context with the rest of the community by comparing data found on their individual records with statistics compiled for the village as a whole. Of course, the study need not be sophisticated and may not be entirely accurate for the purpose of drawing any academic conclusions regarding demographic behavior.Often information found in Italian vital records is only an estimate, such as a person’s age for example. But for genealogical purposes, it can provide insight on what went on in the village throughout most of the 19th century. How long did the average person live? What was the average age at marriage, and what time of year did the majority of marriages take place? Was infant mortality high? How common was your great grandfather’s occupation in this village? What else did others do for a living? In your pursuit to learn the answers to questions that arise, you will learn more about the general history and culture of the village. By constructing a simple graph, you can get visual pictures of all of this, which will reveal patterns and exceptions, such as a steady increase in life expectancy or an unusual number of deaths in one particular year (an epidemic)? Plotting data for five or ten year intervals, will allow you to see how things changed throughout most the 19th century (depending on how much of the historical record survives and has been microfilmed). You can measure infant mortality or gain insight into marriage traditions, but you also need to check other resources to understand the .why. behind statistical patterns that emerge from examination of individual historical records. If you plan to write a book on your family history, a demographic study of your ancestral village, taken together with other sources, such as printed histories, oral histories, correspondence with current village residents, and local historical societies, will make it more interesting. Your ancestors did not live in isolation. They lived within a framework of a local community which in turn existed in a regional framework. 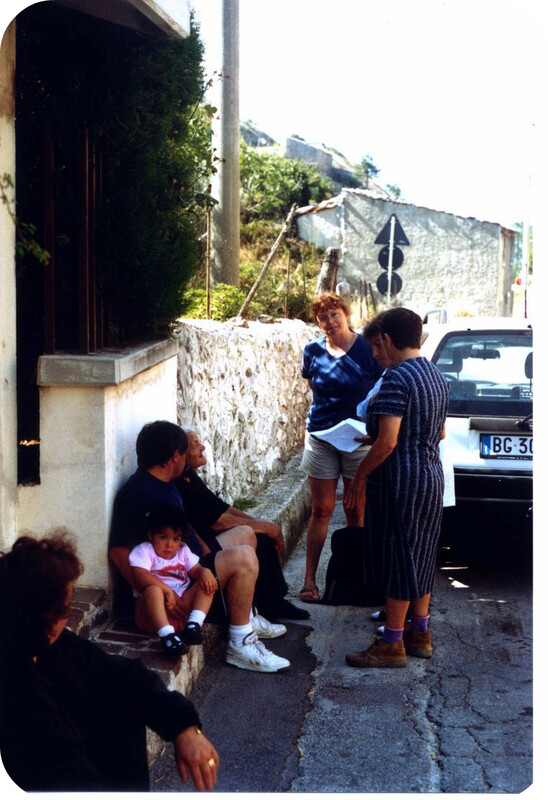 As an example, statistics gathered for the village of Avezzano (AQ) in the Abruzzo Region of Italy, represent a first step in doing a demographic study for the purpose of genealogy. The methodology used is simply to pick a year to begin with and sit down with all of the LDS microfilms that contain records for that year. Go through the films frame by frame and keep a tally of how many deaths (broken down into male or female groupings and noting the age at death and the month). The groupings will in the end reveal patterns that exist, such as an unusually high number of deaths in any certain month or a higher life expectancy for females than males etc. You can keep a tally of births by month or just tally males and females and their ages. You might want to include the age of the parents at the time of birth and their occupation to check differences in birth rate amongst various social groups or age groups. Marriage records provide the opportunity to study the occupations of both the marriage couples and their parents. From marriage records you can also get a sense of immigration into the village from other areas by looking at the birthplace of the couples and residences of the parents. This can also be noted from birth and death records. If there are an extraordinary number of people showing up as not having been born in that village, there may have been a migration. In any case, from this information you would be alerted to seek out more information about the cause via anthropological and other perspectives. Statistics from Avezzano records reveal many interesting things about this village. For example there are quite a lot of people who make their living as seamstresses and spinners. Avezzano has historically been a sheep farming village. If you are familiar with the Italian culture, this may seem obvious, if not, you might not make this connection unless you also consult a printed history of the village. The statistics that emerge should also peak your curiosity to find out more via an economic perspective. It’s always possible that important events in the history of the village will be missed, if every single year is not examined. But that would not typically be feasible. A graph covering five or ten year intervals should be sufficient to provide a general overview of demographic behavior. Data for other years in Avezzano history has not yet been compiled, thus the final graph is not presented here. However, the graph below shows how total population changed over time in the village of Longano (IS), in the Molise Region, based on population figures provided in a manuscript. This makes an interesting visual for a family history book. You can customize your graph(s) however you wish, or just report statistics in the text. It’s your story. But do more than just retrieve individual records for ancestors and list names and dates on a chart. Utilize all tools and resources available and apply as many methodologies and approaches as you can to build the fullest history of your family. Diversity of resources is vital to all types of historical research and extends to genealogy as well. The more resources you utilize, the more chance of uncovering conflicting data and realizing bias. For example, stats for your ancestral village may not jive with generalizations published in the literature. The average age at marriage, may be higher than what is said to be typical for Italians. For the purpose of family history, your individual ancestor should be compared to others in his or her own village, rather than stats derived from other villages that were used to make broad generalizations, perhaps primarily intended to support a writer’s theory for an academic research paper. Demographic perspectives on ancestral villages for genealogists can provide insight into customs and traditions at a more personal level, with actual names attached to the data, (your ancestor’s real neighbors) that can be tallied to reveal change over time, and also visually represented with graphs and charts or woven into the text of a book on the history of your family. Check libraries and historical societies for existing published sources relating to your ancestral village and then do your own study. Debora L. Hill owns and manages the Pallante Center for Italian Research (PCIR). It is a network of native Italian researchers based in various locations throughout Italy and Sicily and also includes a network of microfilm and onsite researchers in the USA. How does one begin to research their family tree? This is a question many people ask me. The answer is………no matter what your ethnic background, your family history story will begin with information and materials you can find within your own family. “Home sources”, meaning what you can learn by asking questions of your relatives, and rooting in family attics is the first step. Your project will later proceed to original research that you will conduct at government offices, archives centers, libraries and historical societies. If you begin in the correct order, the research will proceed one step at a time, from the known to the unknown. Your family tree will eventually begin to grow. It will be accurately documented with each step, before proceeding to the next earlier generation. You may choose to start by researching only your father’s side, and later on begin your mother’s line, or vice versa. Or you may choose to work on all lines at once, but only one generation at a time, since you can’t skip to earlier generations without a solid well-documented foundation. For the inexperienced beginner, I would recommend choosing one single line to research until you gain some experience, or maybe until you get that line back to the immigrant generation. Your specific goals will get revised along the way. Types of records needed will change as you get back into earlier time periods. You will study the local history of many different towns that are part of your family’s story, including eventually towns in a foreign country. Many people seek the help of a professional researcher when they hit this point, especially if they don’t know the foreign language necessary to read the documents. Genealogy research can be very time consuming. A professional can do it faster than you can get it done yourself, even if you are capable of reading 19th century documents written in Italian. Busy people may not have time to search microfilms, choosing to spend what little free time they have with their family. The Pallante Center has the experience and a network of contacts in Italy to build your family tree in a fraction of the time it would take you to do it yourself. Here are some guidelines for beginning a research project on your family history. 1. START WITH YOURSELF – proceed from “known to unknown” in correct order. Keep emotions out, it’s about “facts” …… or don’t do it. Do not record lies or distortions as if fact. Take notes and get a signature to avoid others disputing you after your elders are gone). Also, remember that other relatives may have further information, or a whole different viewpoint about the same story. The info from relatives must be verified. Human memory gets confused over time. Ask to make a copy of old photos or documents relatives have in their pocession. Interviewing relatives is ongoing throughout your research, as new questions will arise. Do prior background research on the person you will interview. Conduct the interview—from the interviewee’s viewpoint–it’s their interpretation. You’re interpretation will be what you extract from it. Allow at least one hour, never more than two. Record the date of the interview and person’s full name. *Don’t press on sensitive issues that may upset people. Don’t publish ,or share, details on living people without that person’s written permission ! 4 . PROCEED TO OUTSIDE RESEARCH –Names and dates must be verified with official documents. Review your information and decide what is missing. Set a goal for something specific you want to try to find. First check to see if someone else has already researched these people. Online sources – Ancestry.com family trees submitted by members. *Caution: If you find a published genealogy, you must still find the actual documents that support the information. You cannot trust that this person’s research is accurate. Next check sites such as Ancestry.com for census records, ship records, etc. – the actual image is often online. This saves you from needing to make a trip in person to the National Archives, or a county historical society, especially if it’s an out-of-state trip that would be needed. But eventually you will need a record that is not easily available online. It’s possible that you may be the first person to do the research on the line that you need to document. Original research. Where to go? What archives office, library, or historical society will have what you need for your specific goal? o Depends what type of information needs to be verified or learned. Original research usually utilizes “primary souce” records (such as an official birth record on file in a government office), and may be supplemented by some secondary source information such as an obituary published in the newspaper. Where the individual type of record source needed is currently housed may differ from state to state and county to county. “Secondary source” materials such as newspaper obituaries could be at your local town library, or the county historical society. Save yourself some trouble by first asking relatives if they have saved any obituaries of family members in a scrapbook. Remember that information given in an obituary could contain errors. It depends on the person who wrote it and how far removed they were from facts they are writing about. If written by a grandchild or a spouse they may not have known for sure some details as well as a son or daughter (but maybe those of closer relationship were no longer living at the time it was written). There may be some things in error, but it may also provide much valuable information. Tombstone engravings are also often with errors, as they are sometimes added years after the death, and anybody can put whatever they want without it being verified. These things are to be used as “clues” to lead you to primary source materials. Detailed descriptions of all the various types of sources that genealogists use to conduct their research, and how to understand each one and get the most out of them, is something for a more advanced discussion. This brief overview is intended for the person just beginning or thinking of beginning and wondering where to start. If you have done your research in your own country and have reached the point of documenting your story up to your immigrant ancestor, you will now need to find specific types of resources that will reveal your ancestor’s town of origin in the old country. In some families, there may be an older relative who knows this information. But if you have to do original research to learn the answer to this question, here is a list of sources where you may find at least some clues about your ancestor’s place of birth (which may differ from his/her last place of residence before leaving the old country). Some sources listed below are easily available through Ancestry.com Most pertain to immigrants who entered the USA during the years of peak immigration through Ellis Island and other ports of entry in the late 1800s and very early 1900s. Ship records (be careful to note if it says “last residence” vs. “place of birth”–not always one and the same thing. Declaration of Intention, Petition for Naturalization, passport, and other immigration related records are a major source for place of origin. Census records (some years contain info on the year of immigration (though often a bit off as human memory gets confused over time). Census rcords may reveal which children were born in the old country, which is a clue to look for a marriage record in the old country, or based on the age of the oldest child, when to look for a marriage record of the parents in either the old or new country. Interviews with your own relatives for any clue at all about the place they came from (was near a volcano, near the seashore, farmland, a city in the north, bordering France…. such clues could at least tell you if it was north, central or southern Italy or Sicily. and surname distribution maps such as http://www.gens.info/italia/it/turismo-viaggi-e-tradizioni-italia?cognome= can occasionally help narrow the focus at least to a general region where the surname exists–if the surname is not extremely common all over Italy. If all that can be learned is the name of a province in Italy, and your immigrant ancestor is male, sometimes he will have an Italian military record (if he didn’t leave Italy before adulthood). If he registered for the military (whether or not he actually served), the military record will give his date and place of birth and parent’s names (as well as a physical description). But to identify the correct person you would need to already know his exact date of birth from another source, or at least the year of birth and parent’s names. Copyright 2012 Debora L. Hill, All rights reserved. Due to privacy laws, the Pallante Center can accept your case for research pertaining to items needed that are at least over 75 years old (some towns may have a 100 year limitation). In Italy, the law is the same. If you need a document from Italy that is more recent than 75 years, we can sometimes obtain the record if we can provide your signed letter of permission and your photo ID with the request. We do not encourage this type of request, unless it is needed for dual citizenship and something you must obtain for purposes other than genealogy. Likewise, in the USA, we prefer to pick up your research project beginning with your immigrant ancestor, or as close to the immigrant as you can get, after you have collected documents in the pocession of relatives, and sent for any documents that fall within privacy law. We can usually figure out the town of origin in Italy, if you have provided enough background information about as many people as possible in the early family, even if some projects may take longer than others to discover the place of origin. along with details about the line to be researched, including copies of birth, marriage, death, church documents etc. that pertain to your direct line ancestors involved, as well as obituaries, tombstone photos or any other materials you may have to show the linking of your earliest person beyond privacy laws to the immigrant. Please provide as much background information as possible on the immigrant family. 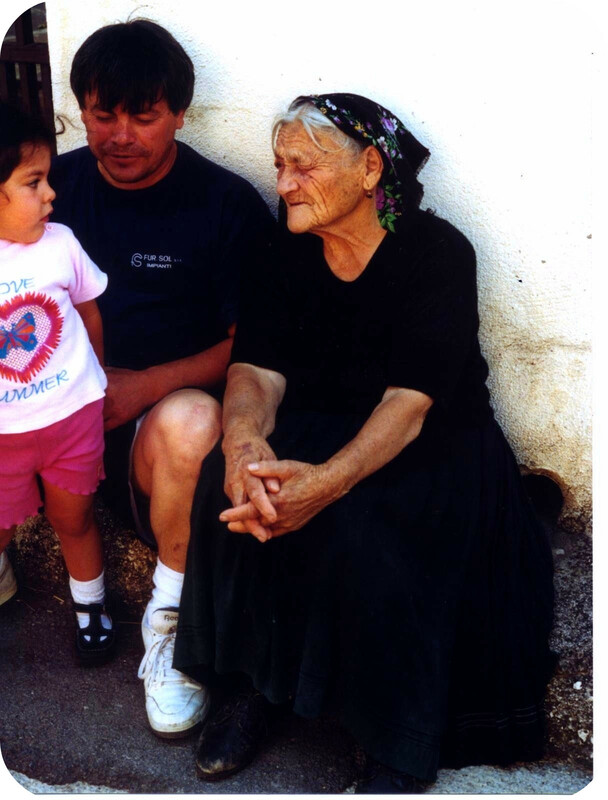 Names of children of the immigrant can be important if they followed the Italian naming custom, and may aid in recognizing the correct family of the earlier generation. Spouses of the immigrant’s children may also provide insight to the larger story, if marriages were kept to people from the same village, or at least “Sicilian” vs. northern Italy etc. Names of children can also aid in finding hard to find census records, where the immigrant’s name is badly mispelled. Rather than speaking in confusing narrative with terms such as “my grandfather”, it is best to use actual names. It also helps if you sketch out a pedigree chart in diagram format, even if just handwritten on paper to avoid confusion and misunderstanding. Upon studying your starting information and documents, and verifying research already done (not to be repeated), we will investigate resources that exist for your ancestral town in Italy, and plan research strategy (which may not necessarily be shared as sometimes this involves proprietary information regarding our special contacts in Italy and what they can do). To begin actual research and get started on your family tree in Italy, then will require an advance payment of $399. You may choose to send the $50 application fee at the same time to speed up the process. It is important to state in advance if possible, whether you will want a full family tree, eventually resulting in a spiral bound family history book, or only a limited number of months–modified smaller project. This will affect how the research is done from the beginning, especially for research that will be done by microfilm. In this case, each time a film is searched, if doing a full tree, all people by one surname will be extracted each time (even if some may not be able to connect to the tree until much later on in the project) to avoid needing to search the same film over again later. Otherwise, if you are only doing a one month session, the research will focus on finding only the specific people requested. and found a woman who was 103 years old. It was awesome to meet a living person who co-existed with my great grandfather, Francesco Pallante, who was born in 1869 ! He left Italy for America in 1903. I asked if she knew him, or remembered what was going on in the village that year. But she was just slightly too young to remember that far back. Her son and his wife had the surname Pallante. They were not direct releatives, but they were delighted to show me around the village. Years before, in the early 1980’s, I had corresponded with the village priest (before the LDS created microfilms for this village). He helped me construct my Pallante family tree by mail. This priest was no longer there, but I remembered the name of a villager he had said was a direct relative of my Francesco. That man “Umberto”, showed me the house where Francesco was born. It sat empty but Umberto took care of it. 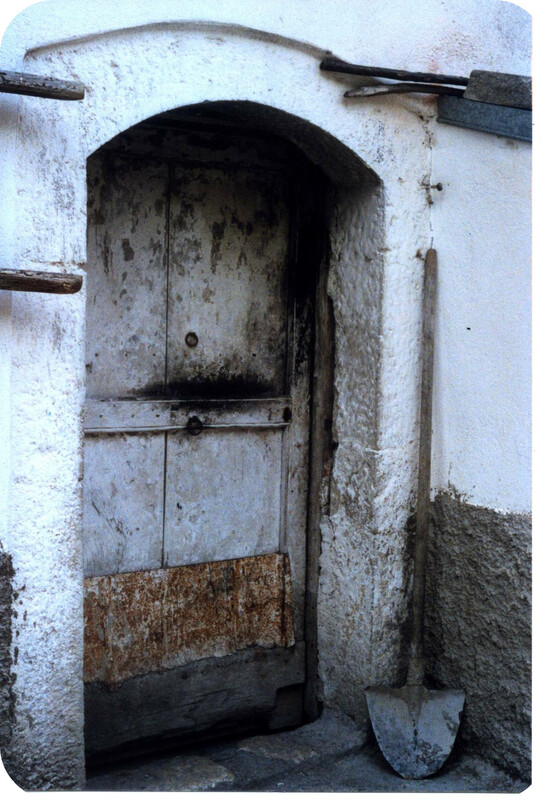 There was a shovel propped up against the door, as if work there was done…… “gone to America”. Outside the church where Francesco was baptised was a very old tree. 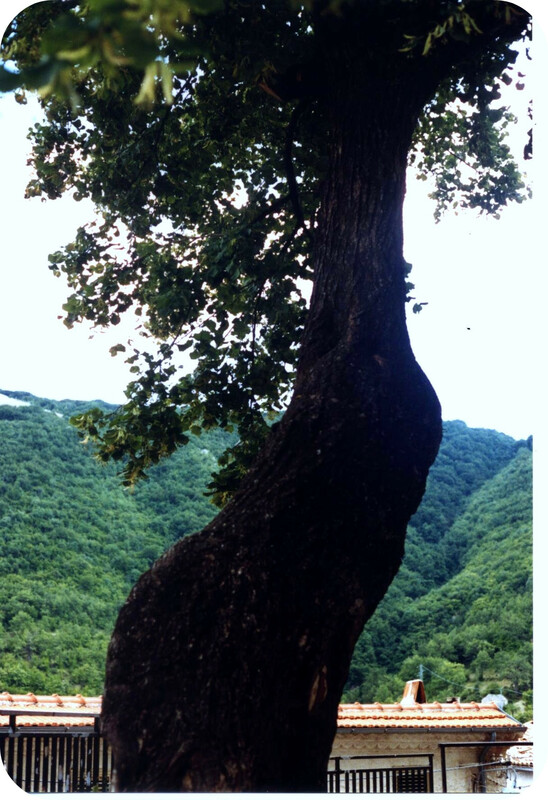 Villagers thought it must have been just a very tiny sapling when Francesco left in 1903. If you have the surname COVIELLO on your family tree, and your ancestors came from Avigliano, the Pallante Center has extensive research already done. Chances are high that you can tie into a pre-existing tree. It’s possible that you may only need one full research session.